Hamburg Airport surpassed the 16 million passenger mark. Commercially, too, Flughafen Hamburg GmbH concluded 2016 successfully. Hamburg Airport is a significant economic factor and an important employer for Hamburg and the region. Hamburg Airport has originally founded the Hamburg Aviation Conference in 1998 and has remained the key partner for the think tank since it was repositioned and managed by XXL Solutions in 2014. Michael Eggenschwiler, Hamburg Airport, CEO, about the Hamburg Aviation Conference 2017: "The conference 2017 was great, focusing on tackling business issues and innovation in an international context. Content, speakers, participants that make you feel like family. Time well spent for decision makers, executive team members and middle management, thought leaders and key influencers in aviation, travel, retail and science. We look forward to "think future 2018!" Hamburg Airport has just launched the next generation of airport. With the new, fully automated baggage drop, passengers will benefit from even more independence and flexibility at departure. The aim is to bring passengers to the plane without time-consuming processes. Since the start of November 2017, ten “self bag drop” kiosks have been in operation in Terminal 1. Four stations have also been installed for automated check-in. The kiosks, developed and manufactured by Materna GmbH in Dortmund, are technically equipped to provide services for all airlines. They “self bag drop” procedure is currently being used by Air France, KLM and easyJet. Other airlines will be added over time. “Already after just a short period of operation, we can see that our passengers are not having any problems with the new equipment,” says Johannes Scharnberg, Director of Aviation at Hamburg Airport. “And we are very happy with the system’s stability. Many of our passengers have already discovered the benefits of the kiosks for themselves and given us very positive feedback. We have hardly encountered any technical anxiety on the part of our passengers. The system is straightforward and self-explanatory. Staff are on hand to provide personal support with the process at any time. So nobody needs to worry about being stuck with a machine and no human help.”. 2017 was a challenging year for Hamburg Airport with strong passenger growth. Passenger figures rose by around 8.6 percent to 17.62 million passengers. More people than ever before used Hamburg Airport for their holiday or business travel. There continues to be great variety in the route network, and the airport has increased service and comfort levels for passengers as well as enhancing the Hamburg touch, with innovations such as the Hamburg Welcome Center, redesigned waiting areas and the flexible Self Bag Drop baggage kiosks. With its optimised infrastructure, Hamburg Airport is preparing for the future demands of air traffic and the growing demand for mobility. 17.62 million passengers used Hamburg Airport in 2017. This is around 1.4 million passengers, or 8.6 percent, more than in 2016. This was the first time that there were more than 17 million passengers in one year in the history of the airport. Aircraft movements, totalling around 159,780 in 2017, were lower than in the year 2000, when just under 10 million passengers used Hamburg Airport. Compared to 2016, the number of aircraft movements declined by around 0.5 percent. A glance at the passenger load factor shows just how efficient air travel is becoming. The average number of passengers per flight in 2017 was 121.4, compared to an average of 112.5 in 2016. The average number of seats per flight has increased from 147 to 156. The load factor on flights to and from Hamburg Airport rose by 1.2 percentage points to 77.8 percent in comparison to 2016. "The conference 2017 was great, focusing on tackling business issues and innovation in an international context. Content, speakers, participants that make you feel like family. Rajiv Shah, CEO at the global travel, transportation and logistics technology provider IBS, which received $170m investment from Blackstone last year: ""Innovation is not a choice for any business in the current dynamic environment. From the technology provider perspective, it is all about ensuring that we can provide the flexibility and agility to our customers, to enable them to drive deeper relationships with the hyper connected consumer". IBS is a leading global provider of new generation IT solutions to the Travel, Transportation and Logistics industries. Lufthansa Cargo chose IBS to set up their test factory. Recently IBS was also selected by Sun Express - a joint venture between Lufthansa and Turkish Airlines - as well as by South Korean based Jin Air as their PSS (Passenger Services Systems) provider. A specialist in the domain, IBS offers a range of products and services that manage mission critical operations of airlines, airports, cruise lines, hospitality partners, tour operators and oil & gas companies that help them increase safety, maximize efficiency, improve revenue, manage growth and reduce costs. Made by Many is a new type of consulting company that bridges the gap between strategy and delivery. It has created a world class digital consulting and product design offering capable of solving the most difficult problems faced by top management. Made by Many identifies opportunities for innovation, prototypes and evolve new product concepts, and designs, builds and launches high performance software solutions ready for scale. Caravelo is a Barcelona based technology company specializing in solutions for the airline industry. We enable airlines to grow incremental revenues, expand their distribution and improve their process management with products that are intuitive, innovative and market leading. Our product suite has expanded to include 9 ready-to-go solutions that connect with airline PSS and associated systems to deliver great results. Our most recent launch, Nina, is the leading white-label chatbot solution for the airline industry. We have 13 contracted clients with more to come in 2017. We are now being recognized by the industry as a go-to provider for innovative and well crafted solutions. Read Caravelo's CEO Inaki Uriz Millan about how Caravelo changes the game in 2017. Collinson Group is a global leader in shaping and influencing customer behaviour to drive revenue and add value for their clients. Their breadth of expertise in Loyalty, Lifestyle Benefits, Insurance and Assistance creates an unrivalled level of insight into affluent consumers and frequent travellers. Together Collinson Group leverages this to develop and deliver market-leading products and services that create engagement, value and loyalty for hundreds of the world's leading companies with millions of end customers across the world. Branchspace is committed to drive travel companies to the forefront of digital retail and enable them to reap the benefits of a world-leading digital strategy and retail platform. data-driven, granular decisions - In today’s hyper -complex distribution environment where travel companies need to reach millions of individual customers in real-time, one-to-one conversations, there is no obvious best way of doing things. For every customer interaction at every touchpoint you need to be able to test, track and analyse the data in order to continuously identify the best converting approach. Intelligent customer touch points - When your target audience is in the hundreds of millions in all age groups and spread across five continents, traditional human -defined market segmentation fails to capture its complexity and no product marketer will be able to define the right products for each of your customers. This is why major travel brands need to rely on intelligent automation systems that create in real -time contextualised products and services tailored to each individual customer. Modular and flexible technology stacks - Agility and the ability to differentiate are key to a successful retail strategy. Therefore, leading travel companies are moving away from “all -in -one” vendor strategies in favour of Best -of -Breed digital retail platforms in order to accelerate business objectives, abstract the eCommerce layer from legacy systems and reduce contractual and operational constraints. Airbus makes the freedom of flight possible by designing, manufacturing and supporting the world's best aircraft. Its people around the globe are united by a passion for aviation, as well as their desire to create better, more efficient ways for airlines and passengers to fly. The small family business established by the brothers Carl and Heinrich Heinemann in 1879 has developed over four generations into a major distributor and retailer for the international travel retail market. Among the global players of the Duty Free sector, Gebr. Heinemann is the only family-run business. The mission for Heinemann is "We live and breathe service, and we create value in an inspiring and emotional way." In the retail sector, Gebr. Heinemann operates more than 320 Heinemann Duty Free & Travel Value shops, fashion label boutiques under licence and concept shops at 77 airports in 28 countries. The company also runs shops at border crossings along with 23 shops aboard ten cruise liners and two ferries. In 2016, Heinemann served more than 40 million customers across total sales space of 120,000 square metres. 15below is a privately owned software development company. Everything we do is built for travel. Our vision is simple – make journeys easier and more enjoyable by giving our clients and their passengers a stronger sense of control. For over a decade we’ve been creating systems and workflows to manage day-to-day travel services and the logistical nightmares caused by travel disruptions. XXL Solutions is more than a consultancy. We are a group of professionals who are committed to help our customers succeed, from strategy to implementation: hands on, target oriented, working with the people in the organisation, delivering more than expected and making things happen. Our claim is “do things differently” because we think one of the reasons for the current problems of organisations is that they have continued for too long to continue doing the same things instead of making change part of the DNA of the culture to be ready for new trends and changing customer needs and to ensure continuous success. This is also where we think the Hamburg Aviation Conference can help to make aviation and travel stakeholders think out of the box and discuss innovative solutions with an open mind. We help airlines, airports, hotels & other hospitality businesses, travel agencies, tour operators, maritime industry, universities, retailers, technology companies, start ups, banks and insurances to transform their business to meet the changing consumer and staff requirements in the digital age, and to turn the new challenges into opportunities rather than threats. Soundreef is a disruptor in the music market. Our music at the end of our breaks was provided by them. Soundreef Ltd licenses its members’ music to users in over 20 countries gathering and distributing royalties on behalf of songwriters and publishers, providing an alternative to traditional copyright collection societies. Soundreef Ltd is an Independent Management Entity (EU Directive 2014/26/EU), listed as a licensing body by the UK Intellectual Property Office. Soundreef offers similar services to those offered by national Collective Management Organizations (CMOs) such as SGAE, GEMA, SIAE and SACEM. The company administers over 215,000 songs throughout the world to provide music for tens of thousands of business users. Check out this video about Soundreef - change to compose the future. At Dabelstein & Passehl we look after our clients individually and personally – and always aware of their needs in a fluctuating economic and technical environment. Based on a well-established international network, we serve our clients anywhere in the world- at any time. Dabelstein & Passehl is a team of experienced and highly specialised lawyers who are all at home in maritime commercial law. The focus of our activities consists of maritime law, transport law and insurance law as well as the law of (renewable) energy. All of our lawyers have had an international training, speak fluent English and often another foreign language. The fact that many of our lawyers also have additional training in their specialist area (Master of Laws, PhD and/or the title of “specialist lawyer”) and hold teaching positions at various universities demonstrates that we take a broader view in our training as well as in our daily work. iMovo specialises in Customer Experience Management (CEM), using Business Intelligence (BI), Big Data Analytics & Customer Relationship Management (CRM). Blending some of the most innovative technology solutions in the market with a formal advisory approach, iMovo enables organisations to build long-term value relationships with their customers resulting in consistent and profitable growth. iMovo helps organisations convert, retain and win back customers by offering a customer experience that is more meaningful and personal. It's goal is to offer best-in-class services and technologies that help businesses visualise and use their information in a meaningful way; enabling them to take the right decisions at the right time. Understanding new roles in innovation and technology oriented businesses and having over 25 years of hands on experience in numerous projects, Comtrade Digital Services help companies reinvent their business models using innovative technology so they can succesfully address business challenges, embrace digital transformation and become industry leaders in their domains. The Mobility & Travel Division at Comtrade Digital Services combines excellent engineering services with travel industry expertise that fosters innovation. Recently, Comtrade Digital Services has helped Ryanair lay the foundations to allow them to become a technology digital leader with an airline attached. Comtrade's big data-enabled platform solves airlines’ key ancillary concern: how to convert journey data into proﬁt. YieldIn is a young and agile startup, offering solutions from a basic flight revenue management tool to simple and smart reporting, ancillary products and services related to RM solutions and dynamic pricing management.YieldIn offers next generations solutions and consultancy services to support revenue management and pricing of the future. AOE is a leading global technology service provider and consultancy, offering Open Source-based Enterprise solutions for digital transformation and Omnichannel E-Commerce as well as mobile apps and web portals. Clients include a number of well known global brands. IN the travel industry there are in particular Condor and Thomas Cook., Auckland Airport, Frankfurt Airport, and just published in November 2017 Heathrow Airport. The London hub will implement AOE’s Omnichannel Multi-Merchant Marketplace (OM³) suite of services to deliver a simplified retailing process for over 300 brands who wish to share products with customers. The company has headquarters in Germany and the USA and branch offices in Dubai, Zurich and Hong Kong. More than 250 employees support international corporations in the operative digitalization of business models through the implementation of open, scalable and secure solutions. AOE relies on excellence and is organized as an agile company. AOE’s award-winning Omnichannel Multi Merchant Marketplace (OM³) helps multi-retailer venues such as airports, shopping malls or integrated resorts to seamlessly fuse offline and online experience into one full-featured suite of software applications and services. OM³ provides a unique platform for omnichannel retailing and offers customers numerous useful online and offline shopping-, service- and real-time information options. Pragma Consulting, founded in 1987, is the UK’s leading consulting firm specialising in commercial strategy, planning and consumer insight. We are a strategic partner for operators and investors in retail and consumer markets, enhancing profitability through commercial insight and action. Our clients include leading retail and F&B brands such as Burberry, Cath Kidston, and Pret A Manger, as well as asset owners and investors. We are responsible for developing commercial strategies, space planning, and revenue forecast models for existing and planned commercial assets across all areas of the built environment. Our specialist airport division is world-leading, and has worked with more than 60 airports in 30 countries over the course of 20 years, serving airports ranging in size from 500 thousand to 80 million passengers per annum. We work for airports including Heathrow, Vienna, Mumbai, and Panama, operating groups such as Vantage and GVK, as well as architects and designers. Our goal is to deliver commercial solutions that generate the optimum levels of financial contribution whilst maximising user satisfaction. No centralized control means no exorbitant transaction fees and no barriers for entry. Moreover, we allow small companies to compete with big players, finally bringing innovation back into the travel industry. Air New Zealand has announced on 23rd November a new partnership with decentralized travel platform Winding Tree to explore applications of blockchain technology in the airline's business. Earlier in October, the Lufthansa Group announced a partnership with Winding Tree, to allow all innovative partners to access its offerings via a decentralized, non-brokered travel marketplace. Today the travel industry is highly concentrated on the distribution front due to core inefficiencies of the internet. The need of a trusted party on the internet allowed intermediaries to concentrate the sector and raise the barrier of entry for new startups. In travel, consumer facing intermediaries often source their inventory from other B2B intermediaries causing double marginalization and inflating the prices. Winding Tree is building a decentralized alternative, to the current concentrated travel distribution landscape, where anyone can access inventory directly from the suppliers. The travel industry is particularly suitable for a decentralized marketplace as the suppliers are experts in what the blockchain cannot provide: customer service, and arbitration. The fuel of our platform is the Líf token. Líf is an ERC20 compatible token with added functionality required by travel companies to send the necessary information within transactions. Líf tokens will have three additional methods, compared to the basic ERC20 token, through which the token holder is be able to send value, data, and/or execute a function on those transfers. This brings extra value and use cases to the token, allowing companies to design more complex and tailored applications on our platform. Beyond the technological advantages of Líf it also has the benefits of other cryptocurrencies such as reduced transaction costs and, particularly important for the travel industry, cheaper international payments. A simple travel booking today can go through multiple FXs. With Líf every party is able to only FX what they need without bearing other parties FX costs. Settlement is also a significant cost for the travel industry today, Líf tokens can be programmed to automatically settle costs. Government departments, airports, staffing agencies and suppliers have a high incentive for settlements to be automated while ensuring on-time payments, low cost of verification, and cutting the currently high costs of settlement. Planitas Airline Systems is a technology company based in Ireland and founded in 2000. Planitas specialises in data processing and data analytical solutions for the airline industry. Customers include among others JetBlue, CityJet, Air Malta, Hawaian. At Planitas they believe that precious airline employee time should not be wasted cleaning and manipulating data. They provide accurate information so that employees can use their business expertise to analyse that data and take the best decisions to increase sales and optimise revenue. The Planitas' team is a multi-talented team that combines airline business knowledge with the latest business technologies to provide solutions that are not only accurate and efficient but also specialised for the airline industry's specific needs. Flio, a global airport app was launched in 2015. Flio aims to become the first global airport app, aggregating airport information and giving travellers exclusive airport retail offers. FLIO provides passengers with valuable information for over 1,500 airports worldwide. Navigate your airport experience in quick time with minimal stress via FLIO maps and A-Z directory. Airport servicessuch as parking for all UK airports and the Heathrow Express can be booked in-app. FLIO users have their very own customer profile, keeping track of all their flights seamlessly, with the chance to dominate global leaderboards. Skyscanner, the metasearch giant, was Flio’s launch co-marketing sponsor. Other partners include Heinemann, Autogrill, Dixons and Heathrow Express. Stephan Uhrenbacher is a key co-founder behind the app. He’s the Internet entrepreneur and investor who helped build lastminute.com, 9flats, and Qype (which was sold to US technology company Yelp in 2012). Co-founder Andy Watson was one of the early employees at Spotify and helped to grow the business across the UK, U.S and Asia. The travel and transportation industry is growing, and expectations are rising from today’s savvier, more connected travellers. IBM’s digital solutions for airlines, railways, hotels and travel services, freight and logistics can help provide the seamless travel experience customers want with the improved efficiency you need. IBM has a key innovation activity in the area of Artificial Intelligence with its Watson program. Artificial intelligence is rapidly coming of age, poised to transform businesses and industries globally. The market for AI is on an exponential growth curve and is expected to reach $16.06 billion by 2022. With over half of all developer teams projected to embed AI services in their apps by 2018, it’s inevitable that consumers will soon be interacting with these new technologies on a regular basis. Blacklane provides an affordable and reliable professional driver service around the world. Low, fixed and all-inclusive rates at the moment of booking are guaranteed. Schedule rides from an hour to months ahead of time with licensed and insured drivers. Travellers receive multi-lingual 24/7 customer care and real-time flight tracking. Blacklane offers a number of smart solutions for integration into the customer journey. Airlines, for example, add different ways of checking in luggage for business class travellers, making it part of the door-to-door experience. Blacklane also enables a smart integration into the booking process. Qatar Airways is one of the airlines offering Blacklane services. What’s your most disheartening problem? Let’s solve it together. That’s how our long-lasting client relationships often begin. As a partner, we create products and services, and help you navigate the complex landscape of modern business. Our hybrid teams work closely with our clients, combining human, cultural, and technological understanding to creative thinking and practical skills. They structure, design and build, iterate, implement, and reinvent, delivering value faster than most consider realistic. That’s something we’ve become quite famous for. Unmatched execution, we like to call it. Our mission is to help airlines improve their passenger experience by giving travellers services that make their lives easier. The solutions we craft focus on e-commerce, entertainment and communication, covering seatback IFE, on-board WiFi, mobile applications and web services. The Airline Passenger Experience Association (APEX) is the only non-profit membership trade organization comprised of the world's leading airlines, industry suppliers, major media groups and related aviation industry leaders dedicated to elevating the passenger experience for more than 80% of global passengers, while driving industry initiatives and desired regulations. The Airline Passenger Experience Association is a network of the world's leading airlines, suppliers and related companies committed to elevating the level of the airline passenger experience. The association offers members a wide range of opportunities to excel in the airline passenger experience industry by keeping them current with the latest industry news, trends and developments and by helping them develop relationships with clients and colleagues from around the world. CARL GROUP is an owner-managed, full-service company in the field of live communication and over the past 15 years has developed into a major service provider in this field within Germany and Europe as a whole. As we seek to not only talk about the opportunities through technology but also showcase what is possible we have chosen the Carl Group. With the team from Carl Group we manage to keep innovating and trialling new solutions every year. 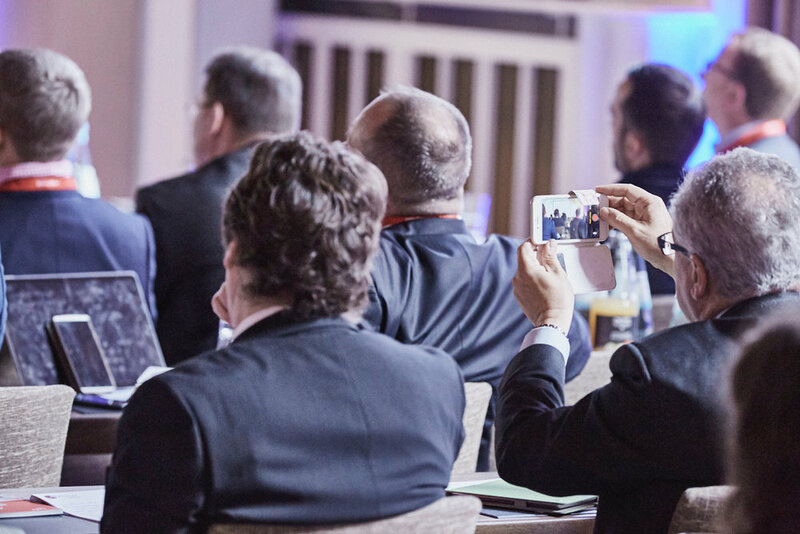 Whether it’s a small-scale conference or a major conference or occasion – in the world of event technology we know that only perfection is good enough. This requires a number of components: technical systems functioning at the 100% level, a team which has a perfect command of the technology, real passion and all-round professional expertise. Your event will only be a complete success if all these components are in place. Robin Kater is the official photographer for our think tank. His brief was to take photographs in a similar style to Pet Souza, who was the official photographer for Obama: natural snapshots of all key moments yet without anyone really noticing that he was there. Robin manages this perfectly. He has just finished his studies, and has started to get a name for his fashion photography. He also opened his studio for photography in Berlin. Since the conference 2015 we introduced the "get your professional photographer" as a free service for delegates to get a photograph. We realised that many delegates appreciated this service and saw back many of the photographs on linkedin and facebook pages. Schellenberg & Kirchberg PR is an owner-managed agency offering the full range of individualised public relations services. The agency is managed by Cord Schellenberg, formerly the (non-partisan) senate spokesman for the Free and Hanseatic City of Hamburg before establishing Schellenberg & Kirchberg PR in 1997. He is also the voluntary Vice President for the Luftfahrt-Presse-Club e.V., the German aviation press association. Cord has been enhancing our think future event through his co-moderation and support for several years. His skilled and experienced team maintains very close contact with editorial departments and many associations and institutions. As a result, they are able to deliver personalised consulting for individual clients and guarantee high performance and effectiveness. They utilise their PR expertise to help customers position their brand and their company within media and public circles. By applying the full weight of our conceptual, editorial, organisational and networking strengths, they live up to our customers’ highest expectations and specific needs. Originally founded in 1989 as Austria's first student consultancy, uniforce Consulting GmbH has a longstanding experience in conducting projects with nationally and internationally renowned brands. Customer satisfaction is the main target of uniforce during consultancy processes. That is why uniforce offers individual and flexible solutions in its portfolio and services. Ranging from market analysis, marketing solutions, human resources services, and digitalization to entrepreneurship projects, uniforce provides its customers with professional project management and high-quality results. uniforce consultants come from academically diverse backgrounds including business and economic sciences, law, psychology, technical sciences or media science and routinely rank among the best of their universities. Due to its long experience from more than 300 projects in 28 years, as well as its very skilled and committed young professionals, uniforce makes sure to find innovative and customer-oriented solutions for every business model or company size.